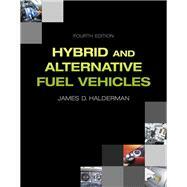 Hybrid and Alternative Fuel Vehicles, 4/e is the ideal text for a modern service technician’s course on hybrid electric vehicles. It combines essential background information with up-to-date, vehicle-specific information on the latest makes. Presented in a full-color format with over 60 new photos and line drawings to bring the concepts alive, plus helpful tips to guide students through the procedures they’ll use on the job, the book covers the Chevrolet Volt, Tesla, and Nissan Leaf; the Buick LaCrosse mild hybrid; two-mode operation and transmission operation; high-voltage and auxiliary battery locations; the SAE J1772 electric vehicle plug; Level 1, 2 and 3 charging stations; and the latest alternative fuels. It also covers both engine performance (ASE A8 content) and advanced engine performance (ASE L1 content), enabling instructors to teach both ASE areas without requiring separate texts. To keep your course current, all of the content is correlated to the latest NATEF tasks and ASE areas; all of the chapters are updated with the latest technology; and new chapters are included on oxygenated fuels; propane, CNG, LNG, and synthetic fuels; and electric and plug-in electric vehicles. New information has been added on HV battery testing using a scan tool and procedures for HV battery reconditioning added to Auxiliary and High-Voltage Batteries, and two new appendixes include a new sample ASE-type certification test for Hybrid/Electric Vehicle Specialist (L3) and an updated NATEF correlation chart for hybrid electric vehicles tasks.